Vibrating Bin Dischargers are proven to enhance the flow of bulk materials from storage. They provide an efficient means for discharging dry materials from storage bins on a first-in, first-out basis with positive, continuous flow. Carrier offers a variety of discharging solutions, including vibrating bin dischargers, live bottom bins, vibrating live bins and storage pile dischargers. The primary function of a bin discharger is to cause material to flow. It is not a metering device. Metering can only be accomplished by some type of feeder, such as vibrating or belt type. Vibrating bins can also discharge directly into a truck or rail car. Vibrating Bin Discharger – Carrier/Vibranetics vibrating bin dischargers provide an efficient means for discharging dry materials from storage bins on a first-in, first-out basis with positive, continuous flow. The primary function of a vibrating bin discharger is to cause material to flow. It is not a metering device, though often a feeder can accomplish metering. Live Bottom Bins – A convenient variation of the bin discharger is the live bottom bin. This pre-engineered, pre-assembled unit is particularly suited for new or expanded facilities. A standard live bottom bin consists of a cylindrical tank that is fitted with a full-size vibrating bin discharger. A “Super Seal” is used to seal the discharger to the bin. Vibrating Live Bins – Another variation of the vibrating bin discharger is the vibrating live bin. The entire unit vibrates rather than just the discharger at the bottom. The units are completely pre-engineered and pre-assembled and available in a wide range of standard sizes. Custom sizes are also available. 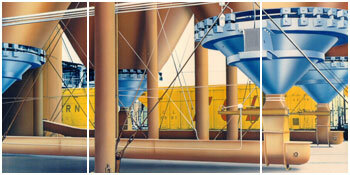 Storage Pile Dischargers – Storage piles are an economical arrangement for storage of large quantities of bulk solids. The storage pile discharger is engineered to produce a predominantly vertical flow-stream of predictable diameter to 1) withdraw uniformly and concentrically and 2) maintain constant command of the top layer sloughs. More on our vibrating bin dischargers.